As one of our recipe testers pointed out, the term “chili powder” means different things to different people. And that’s okay. It can mean straight-up chili powder that you buy in a jar from the grocery store. It can mean ancho or chipotle or any other chile powder that you fancy most and rely on to glam up everything from mayo to your morning eggs. It can mean whatever makes you happy. So go on, make someone—namely, you—happy with this quick posole recipe. Oh, and despite this recipe’s seemingly simple ingredient list, it results in the complex taste of the real deal. 1. If making the pork in a 6-quart pressure cooker, add the oil to the pressure cooker and heat over medium-high heat. Season the pork on all sides with salt. Add the pork and cook until browned on all sides, about 8 minutes. Transfer the pork to a plate. Add the onion, garlic, and chili powder to the pressure cooker and sauté until softened, about 4 minutes. Add the stock and the water and cook, stirring and scraping up any browned bits with a wooden spoon, until the mixture comes to a simmer. Return the pork to the pressure cooker. Secure the lid. Bring to high pressure over medium-high heat. Reduce heat to maintain pressure and cook until meat is tender, about 45 minutes. Remove from heat, vent pressure, then remove lid. If making the pork in a slow cooker, season the pork on all sides with salt. In a large skillet, heat the oil over medium-high heat. Add the pork and cook until browned on all sides, about 8 minutes. Transfer the pork to the slow cooker. Add the onion, garlic, and chili powder to the skillet and sauté until softened, about 4 minutes. Add the stock and the water and cook, stirring and scraping up any browned bits with a wooden spoon, until the mixture comes to a simmer. Pour everything from the skillet over the pork in the slow cooker. Cook on low until the meat is tender, about 8 hours. 2. Skim any fat from the surface of the cooking liquid. Remove the pork and either chop it into bite-size chunks or shred it using 2 forks. Return the pork to the liquid in the cooker along with the hominy and heat for just a few minutes, until the hominy is warmed through. Season with salt and pepper. Serve the posole with the avocado, cilantro, and lime, plus radishes and chips, if desired. I’ve made and enjoyed a number of posole recipes over the years, but I have to say that this quick posole recipe is now my favorite. The broth was fragrant and spicy with chili, and the pork was meltingly tender. The best part of the recipe was how quickly and easily the transformation occurred in my pressure cooker. I served the posole with avocado chunks, Mexican crema (sour cream would work, too), and some crumbled cotija. Truth-in-testing disclosure: I love almost all forms of posole or pozole. I have been known to stop in at Mexican grocers on the way to airports to pick up frozen nixtamal and fly home with it. I’ve taken dried limed corn and dried chiles on 10-hour flights to prepare posole for family. I have had it simply and blandly prepared in reservation cafes as well as in fancy Santa Fe restaurants. And I have had posole verde and rojo, quick and complicated. That said, I am as happy as anyone else when I can find a method for posole that quickly satisfies my love for this heartwarming soup. Much as I love Rick Bayless for his detailed authenticity, even I have shortcuts, and while I will dedicate 2 to 3 days to soaking dry corn and making pork stock, I draw the line at pig trotters. And if I can have posole on a weeknight, all the better. 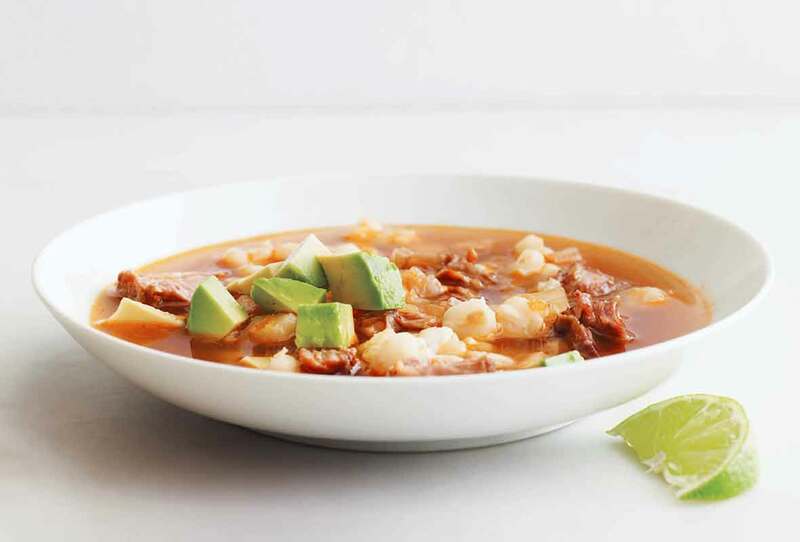 This quick posole recipe turned out to be even better than I had hoped, and it was so easy. if you have stock on hand, use more stock instead of water in this recipe. I was lucky that we had 2 cups pork bone stock from the previous day and I added 4 cups chicken stock. My previous posole experience always involved making stock, and I think it’s worth it. If you want to keep this quick posole recipe mild, allowing for individual servings to be spiced up with added hot sauce, use a combination of ancho and mild chili powder. If you want more heat overall, use a combination of ancho and chipotle. I served this with fresh lime, queso fresco, and Spiced Pumpkin Seeds and a dash of Rancho Gordo’s La Paloma, a not-very-hot sauce, but one that’s rich in flavor. It nicely complemented the spice of the posole. The best part of making a satisfying batch of posole from any recipe is it gets better over the next day or so. I love having it on the second and third days even more. I don't have a pressure cooker, so I adapted this quick posole recipe for my slow cooker, which makes it really nice when you get up in the morning and the whole house smells like posole! It does take about 25 minutes to get everything in the slow cooker, but after that it's just 8 hours of patient waiting. I used the low setting on my slow cooker so it could cook all night. It may have been done before the 8 hours was up, but I left it alone. This recipe yields about equal amounts pork and hominy once it's all done. I was up early enough that I strained the fat, put the juice back in the slow cooker, shredded the pork, added the hominy, and let it cook for another hour, which was more than enough to warm the hominy. Personally I prefer to leave the pork in small 1/2- to 1-inch chunks rather than shredding the pork. This recipe was the first time I've shredded the meat and I'm not a big fan. I also prefer to add tomatoes, which for this testing I did as a garnish so I didn't alter the underlying flavors. I believe that adding the tomatoes during the last part of the cooking process would benefit this recipe. The cilantro and lime are fantastic additions, so don't leave them out. The avocado adds a pleasant creaminess to the dish. 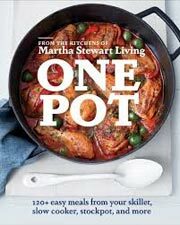 Quick Posole Recipe © 2014 Editors of Martha Stewart Living. Photo © 2014 Andrew Purcell. All rights reserved. All recipes and photos used with permission of the publisher.